LT Company is premium WordPress theme that can be used for any kind of businesses or company websites. The theme looks clean, professional and interactive. Its main purpose is to point out the most important information about the company, the team members and their work. 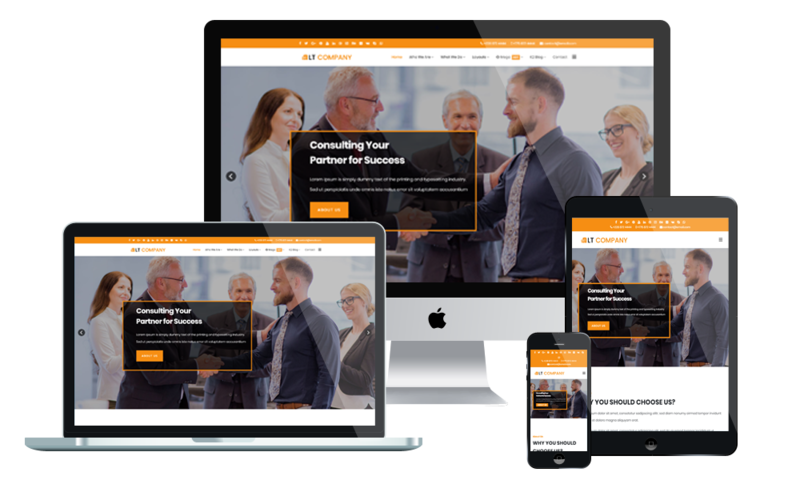 Company WordPress theme comes with a responsive and mobile-friendly design that makes your website look spectacular across all screens, tablets and mobile devices. With this theme, you can expect to find lots of advanced options like strong shortcodes, highly customizable theme options and a wide variety of gallery and portfolio layouts. Besides, we also offer support services like drag-drop layout content, Bootstrap CSS & Hybrid framework, unlimited color and a color picker in the admin panel. Showcase your company profile to customers for the purpose of introducing fields of business, the strengths and products-services with ease on this page. Besides, we can help clients visualize the relative about your companys products. If you want to strengthen a company, it should have a qualified executive management team, job requirements tied to the strengths of each person. This page will give customers the exact information about the team of executive management. In order to create the most favorable environment for attracting investment in projects of your company, this page will introduce and help customers understand the details of the project including project scope, legal, strategic location, ect. Portfolio page showcases gallery about featured projects of your company for your customers. It allows you to categorize and tag your projects in a way that does not overlap with the rest of your posts. We offer a variety of creative designs in an eye-catching manner for portfolio page. For this page, customers easily search address, phone or fax number of your company with separate tabs for each section. On the other hand, they can send their feedback via mail or navigate to your companys location by map just a click.